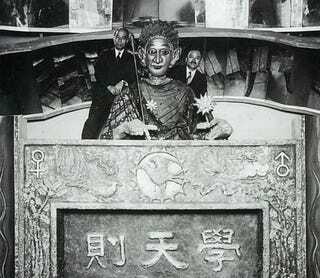 Gakutensoku is Asia's oldest modern robot, built in 1928 for the ascension of the Emperor Showa (aka Hirohito). Twice as tall as the emperor at 10 feet, 6 inches, it could tilt its head, blink, smile and puff up its chest and cheeks with a system of inflatable rubber tubes. Long lost in Germany before returning to Osaka, it's been restored and brought back to life with a $200,000 computer-controlled pneumatic servo system. But it definitely still moves like an 80-year-old—very slowly. Check out the video of it in motion below, it's like a robot from "It's a Small World," but even more uncanny and creepier.